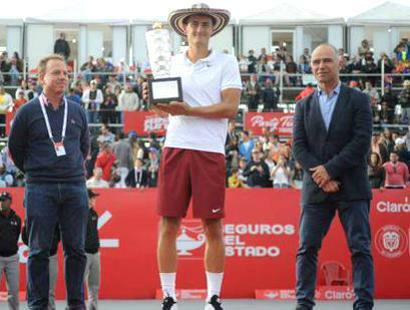 Australian bad boy Bernard Tomic has shrugged off his Miami arrest and banishment from the Davis Cup team to successfully defend his ATP title in Bogota. Tomic was accused of hitting "rock bottom" by Tennis Australia's high performance chief Pat Rafter after being charged for resisting arrest and trespass in relation to a noisy hotel room party he hosted earlier this month. However, the negative attention does not appear to have affected the controversial 22-year-old's tennis. He battled past Frenchman Adrian Mannarino 6-1, 3-6, 6-2 in Sunday's final of the Claro Open to join Grigor Dimitrov and Milos Raonic as the only players born in the 1990s to win three tour titles. "It's been a very good year," Tomic said on the ATP website. "I started at No. 70 (in world rankings) and am now close to No. 20. It's been a good seven months. "I'll try to play well the next three months and have the chance to be in the Top 15." Tomic, whose ranking has improved to 25 from 29, was kicked out of the Davis Cup team after a tirade against Tennis Australia (TA) officials at Wimbledon. Australia won their quarter-final tie against Kazakhstan without him but want him back in the side for the semi-final against Britain in September. TA offered peace talks with Tomic to facilitate that but he rejected the overture last week and said the feud would continue as long as the governing body declined to fund his sister's development. Sara Tomic plays mostly second-tier ITF tournaments but TA cut her funding, citing the uncooperative attitude of her father. Bernard Tomic slammed TA's decision at Wimbledon and publicly criticised a number of Australian officials in an extraordinary outburst.